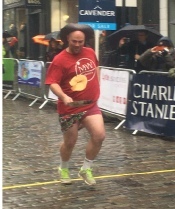 The 2018 Guildford Pancake Races were held in Guildford High Street on 13th February 2018 starting at 11:00 AM with the first race getting underway at 11:30. 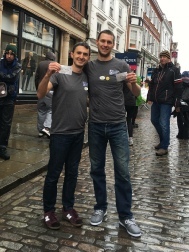 This year the races supported the Prostate Project. 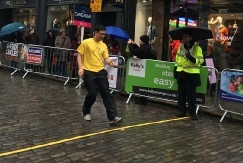 We had many past sponsors support us again this year and they were joined by some new ones such as The Guildford Escape Rooms who are located at the lower end of Jeffries Passage in what used to be the old Parish Workhouse building, currently the Edinburgh Woollen Mill. Another new Sponsor was MW Solicitors who have relocated into the centre of town at the junction of North Street and the High Street. 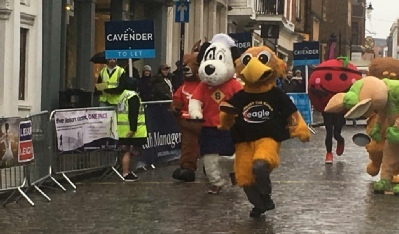 Some of our more regular supporters included Clyde & Co, DMH Stallard, Charles Stanley, Experience Guildford and of course Cavender’s Estate Agents who sponsored the Mascot Race once again. 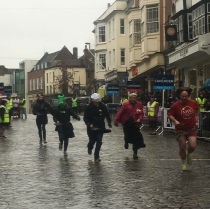 Thanks also to the Guildford County Club who sponsored the Council’s Race again this year and also covered the cost of hiring the Guildhall. Spectrum Bowling, Skating, Swimming and Membership tickets! And many more from companies such as Harbour Hotel, Margaret Dabbs, the Boiler Room, Pizza Hut and Maverick Man barbers. 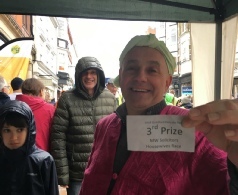 The race was won by Mike Brawley of MW Solicitors who hoiked up his maxi dress to reveal a truly muscular set of pins and a few other things. That, together with some perfect tossing, meant he stormed home to 1st place. Dress tips for next year can be found HERE. 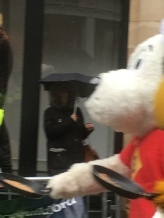 In the worst weather we have ever had for a Pancake Race we were expecting the Mascots to bottle it. They didn’t! 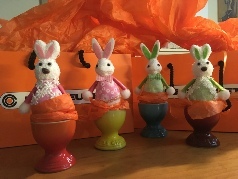 Thank you Steve, Specky, Cherry, Roary, Eggbert and Kelly for entertaining the crowds! After Kelly had dropped his pancake, it looked like Eggbert had the race in the bag. But as the photo finish above clearly shows Specky won the day! 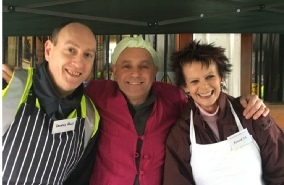 Thanks to Emily and Waitrose for providing both the eating and racing pancakes again this year! In an unusual twist of fate the race was won this year by GBC! Both teams gave it everything they had.